“`Rondo Hatton had a face for horror cinema. Beginning in the 1930s, this former journalist went from film extra to horror movie star. He played a monster in Universal Studios flicks, House of Horrors and The Brute Man. Over the decade, Hatton earned cult status. Rondo was known for his facial disfigurement, a result of acromegaly; the syndrome caused from a disorder of the pituitary gland. He died in 1946 from the disease. “`The Rondo Hatton Classic Horror Awards are named in his honor. The trophy is a little gray bust of his head. The Rondos recently gave out this year’s statuettes. The Shape of Water was voted Best Movie of 2017, beating Wonder Woman, Blade Runner 2049, It, and Get Out. Stranger Things, Suspiria Blu-ray and Rue Morgue Magazine also received awards. 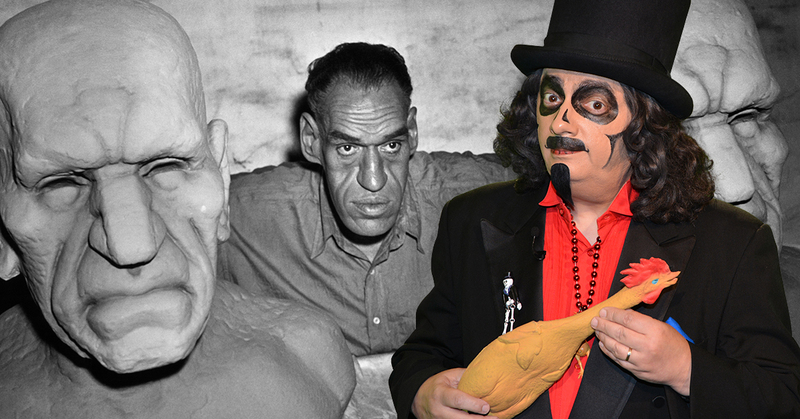 “`MeTV’s Svengoolie took home the trophy for Favorite Horror Host. It was his seventh time winning the award. Sven beat out runners-up Elvira and Joe Bob Briggs. Honorable mentions in this category included Dr. Gangrene, Penny Dreadful, Count Gore De Vol, Lord Blood-Rah, Karlos Borloff, Bone Jangler and Son of Ghoul. Svengoolie received a record number of votes in the category. “`Over 3,700 ballots were cast via email by the Classic Horror Film Board, the largest survey in the organization’s history. This entry was posted on Thursday, April 12th, 2018 at 12:02 am	and is filed under Blog by Manny Pacheco. You can follow any comments to this post through the RSS 2.0 feed. You can leave a response, or trackback from your own site.